Though it can be found all over the coastal Gulf waters, Black Grouper much prefer the warm waters of south Florida, staying close to reefs and other populated marine habitats. Thanks to our central proximity in the state, it is common for this fish to venture into our area making our chances for Black Grouper fishing that much more likely. Description: Black Grouper are olive green to dark gray in color with box-shaped darker patches that cover their bodies. Although it commonly gets mistaken to be Gag Grouper, the Black Grouper is much darker in color. Like most grouper, they start their lives out as females and turn into males as they age and grow. Size: One of the largest species of common grouper around, the Black Grouper can often weigh between 40-50lbs, but is quite able to exceed 100 lbs. They make for excellent eating if you should choose to keep your fish. Location: These elusive grouper can be fished in offshore waters of 60ft and deeper, often near reefs, rocky bottoms, and shelves (mostly adult males). Younger grouper, predominantly female, can be found inshore along inlets, bays, and grassy sea beds. We happily offer many fishing charters that can help with your Black Grouper fishing trips. 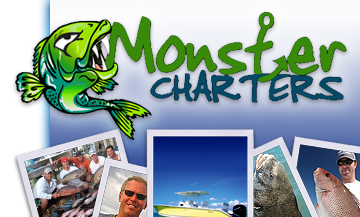 Contact Monster Charters today for more information about our participating charters and we can help you find the perfect one to suit your fishing needs!